Trails in RVNA are a mishmash - old logging 'skid' roads, and game trails made wider by hikers and bikers. Some trails, both downhill and lateral, were built by bikers for their purposes. You will see banked curves, and mounding to make jumps and roller coasters. Wooden jumps and whatnot were removed by River View Cemetery groundkeepers when the property was privately owned. Eventually, the ad hoc trails in the interior will be closed off and decommissioned, so now is the time to see the interior forest. Before going, check the maps — they will help make sense of the trails. The trails are marked with laminated signs that are consistent with the maps here. The trail number sign(s) at the HWY43 hub vanished in Sept 2017 and haven't been replaced yet. Hike to the Bottom and Back - [PDF]. This map shows how the recommended way to get to the bottom, avoiding the steep and eroded (rooty) segments of trail #6 & #7. So at (G) on the map you could go up Trail #6, or at (M) on the map, you could go up trail #7. In either case, you'll end up back at the Hub (H). FYI: From the bottom (N), Trail 3 goes up to the Lewis & Clark College lower parking lot, and ends there, so this is a direct route to the college. (Revised 6/2018). Note STEEP warnings. The east end of Trail #7 between J-K-M is not advised. We provide other maps on our About RVNA page. There is No parking available on Palatine Hill Road. You can park along SW Brugger, just off Palatine Hill Road, and enter RVNA from there. Please park only on one side of Brugger so as not to choke fire engine access. You can get to RVNA on Trimet Line #39, weekdays only. We do not recommend accessing RVNA from Macadam (Highway 43). Some trail segments are eroded and steep. Avoid sections marked STEEP. RVNA can be dangerous during strong winds, and muddy after a good rain. You may encounter mountain bikers who do not respect the March 16, 2015 closure. They do not need to be reminded that they should not be in there. Pack out your trash. Pick no flowers! Watch out for snails. Please leave in place any vines or weeds that have been tossed on trail. They will be removed by Parks. See our FAQ (link in above header) for who to call to report any issues. 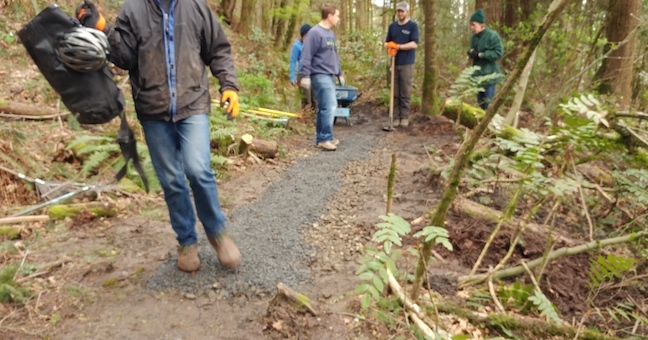 On April 8, 2017 FoRVNA participated in a trail maintenance workshop. The first half was in a classroom, second half in the field. 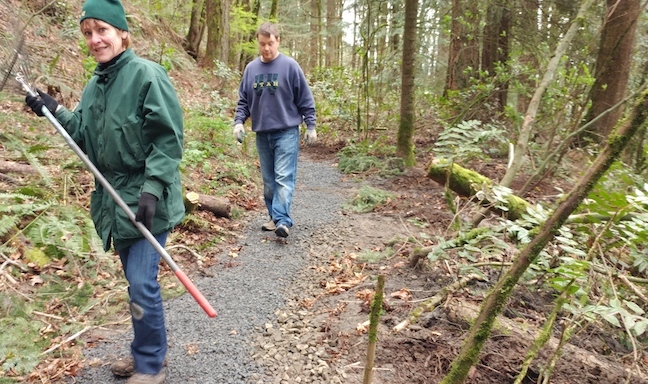 The group learned hands on — restoring ~30' of the Wildwood Trail, below Pittock Mansion. This might not sound like much, but the teams rotated, learning benching techniques, building rock walls, and how to raise the tread (PP&R's jargon for The Trail).